Newswise — Professor Julia Hirschberg has been elected to the National Academy of Engineering (NAE), one of the highest professional distinctions awarded to an engineer. Hirschberg was cited by the NAE for her “contributions to the use of prosody in text-to-speech and spoken dialogue systems, and to audio browsing and retrieval.” Her research in speech analysis uses machine learning to help experts identify deceptive speech, and even to assess sentiment and emotion across languages and cultures. Hirschberg’s main area of research is computational linguistics, with a focus on prosody, or the relationship between intonation and discourse. 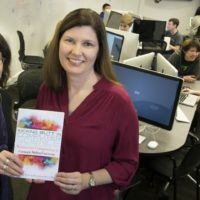 Her current projects include research into emotional and deceptive speech, spoken dialogue systems, entrainment in dialogue, speech synthesis, text-to-speech synthesis in low-resource languages, and hedging behaviors. Among her many honors, Hirschberg is a fellow of the IEEE (2017), the Association for Computing Machinery (2016), the Association for Computational Linguistics (2011), the International Speech Communication Association (2008), and the Association for the Advancement of Artificial Intelligence (1994); and she is a recipient of the IEEE James L. Flanagan Speech and Audio Processing Award (2011) and the ISCA Medal for Scientific Achievement (2011). In 2007, she received an Honorary Doctorate from the Royal Institute of Technology, Stockholm, and in 2014 was elected to the American Philosophical Society. Hirschberg joins Dean Boyce and many other Columbia Engineering colleagues who are NAE members; most recently elected were Professors David Yao (Industrial Engineering and Operations Research) in 2015, Gordana Vunjak-Novakovic (Biomedical Engineering) in 2012, and Mihalis Yannakakis (Computer Science) in 2011. On February 8, the NAE announced 84 new members and 22 foreign members, bringing its total U.S. membership to 2,281 and foreign members to 249. NAE membership honors those who have made outstanding contributions to engineering research, practice, or education, including significant contributions to the engineering literature, and to the pioneering of new and developing fields of technology, making major advancements in traditional fields of engineering, or developing/implementing innovative approaches to engineering education.